From 24.05.2012 to 03.06.2012, the Cameroon U-20 national football team will participate in the Cape Town U-20 International friendly tournament. Last week, the Fédération Camerounaise de Football published a list of 28 players who are considered for the tournament. 18 of the players are playing in the MTN Elite One 2012. In this post, I will give a short presentation of these players. * Ane was signed from the Friendship Academy in Douala before the MTN Elite One 2012. He is already an established member of the first team at Union Douala. The lanky midfielder was part of the Cameroon U-17 national football team in 2011. * Atouba Emane is arguably the star of the squad. The youngster is key player at Canon Yaoundé and can be described as a hard-working and creative midfielder. He has scored twice so far this season. Atouba Emane has experience from the 2011 FIFA U-20 World Cup. Obviously, the clip could be wrong and personally, I think it is strange that I cannot find any information about a player who is reportedly 26 years old. It is just as likely that he is a talented youngster and in any case, Bassilekin is obviously a quality striker. * Unisport FC signed the petit Eloundou from AS Fortune, based in the Cameroonian capital Yaoundé, before the MTN Elite One 2012. 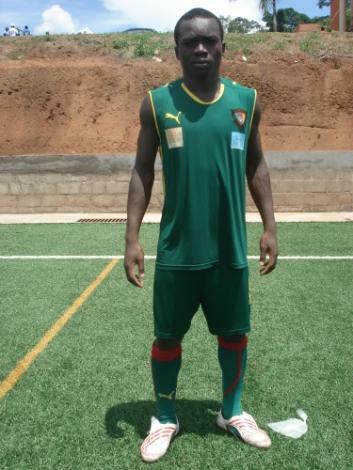 During 2010 and 2011, Eloundou was part of the Cameroon U-17 national football team. He has scored one league goal so far this season. The picture is of Eloundou and is taken from http://www.sourcesducameroun.com. * When Collins Maifanya joined Panthere Sportive after the MTN Elite One 2010-2011, Kerrido became first choice goalkeeper at Unisport FC. Kerrido has never looked back and some experts have likened him to legendary goalkeeper Joseph-Antoine Bell. * Libiih, most likely born in 1994, joined Renaissance FC from the All Sport Academy in Yaoundé. The current season is Libiih’s second at top level of Cameroonian football. Libiih has played regularly for the Cameroon U-17 national football team in 2010 and 2011. * To be honest, Manga Mbah is a completely unknown player to me. Manga Mbah was officially registered in the Cotonsport-squad for the CAF Champions League, suggestion he is a promising player. * Mbaï is still a fringe player at Union Douala but he is highly regarded and definitely one for the future. Mbaï is a natural goalscorer known for clinical finishes. He is a product of the Eugène Ekéké Academy. Mbaï was part of the Cameroon U-17 national football team in 2011. * Mbongo Ewangue, a speedy and athletic attacker, is one of the star players in the preliminary squad. He plays regularly for Cotonsport FC, the top club in Cameroon, and has already featured for the Cameroon B national football team. Mbongo Ewangue starred for the Cameroon U-20 national football team during the 2011 FIFA U-20 World Cup. * To be honest, I did not know that Mohamadou had joined Renaissance FC. Mohamadou is a product of Fundesport from Douala, also known as the Samuel Eto’o football academy, and was part of the Cameroon U-17 national football team in 2011. As far as I know, Mohamadou is highly regarded in Cameroonian football. * Moukap has been a fringe player at Unisport FC this season, mostly because of competition from great centre-backs such as Marcellin Gaha Djiadeu, Charles Lobe Lembe and Thierry Tonye Biheng. * Mfombam Mounchili is the new first choice goalkeeper at Union Douala, signed from APEJES FC de Mfou before the current season. Mounchili was training with the Cameroon U-23 national football team last year. * Ndongo is a rather unknown midfielder at Sable FC. He has featured regularly this season. * Talented left-back Nyamat has been able to force his way into the first team of Astres Douala in his first ever season at top level of Cameroonian football. * Onana Ndzomo has been a revelation for Canon Yaoundé this season and is already an established member of the first team. * Owono Mbassegue is a former player of AS Fortune, based in the Cameroonian capital Yaoundé. He has also been an important player at the Cameroon U-17 national football teams for the last couple of years. * Frantz Pangop, a rather unknown striker, has scored one league goal for Sable FC this season. * Moussa Souleymanou is a very quick, tricky player who loves to challenge defenders with his speed and dribbles. Souleymanou was part of the Cameroon U-17 national football team in 2010 and is widely considered to be one of the biggest talents at Cotonsport FC. According to trustworthy sources, several top clubs are already following the left-sided player. Souleymanou is a rather small player, apparently about 165 centimeters. Do you know a Player named Xavier De Souza Kodjo? He is also from Kamerun (played for Douala) and will know play for Antalya!